PROVIDENCE, RI [Brown University] – Adam Blumenthal, an interactive media designer and producer, has been named Virtual Reality Artist-in-Residence with the Granoff Center for the Creative Arts and the Center for Computation and Visualization (CCV) at Brown University. His residency will begin on June 1 and will run through May 31, 2017. In this role, Blumenthal will design and build immersive interactive experiences with the CCV’s YURT virtual reality (VR) facility and the VR systems at the Granoff Center. Blumenthal is an interactive media strategist, designer and producer, and has been a virtual reality researcher and practitioner since 1990. During his career he has worked with emerging digital media and dozens of the world’s best-known companies, philanthropies, and institutions. Blumenthal designs media programs that address stakeholder engagement, education and corporate training, marketing and the creation of new revenue channels in markets where traditional business models have been disrupted by new technologies. Blumenthal has produced large-scale interactive media programs with organizations and groups including Columbia University, Duke University, The Ford Foundation, The United States Department of Treasury, The Metropolitan Museum of Art, National Geographic, Sony, Hasbro, Mattel, the Grateful Dead, and many others. The Center for Computation and Visualization, part of Brown’s Computing and Information Services, supports the community at Brown by partnering with researchers — and artists — in their computational efforts, both by participating directly in the research and by providing advanced computing technologies, such as a high performance computing cluster and the YURT, a state of the art virtual reality display. Since 2011, the Perry and Marty Granoff Center for the Creative Arts at Brown University has provided multidisciplinary opportunities for students and local artists to collaborate on new initiatives crossing traditional academic boundaries. 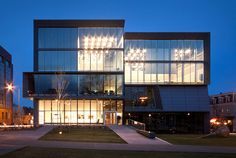 The Granoff Center serves as a catalyst for collaboration between and among the arts, sciences, and humanities. Within the Center, creative thinkers from across disciplines can come together to work collaboratively, exchange ideas, and create new art forms.